Da Capo Press, 9780306821202, 472pp. 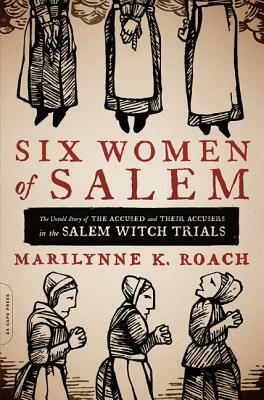 Six Women of Salem is the first work to use the lives of a select number of representative women as a microcosm to illuminate the larger crisis of the Salem witch trials. By the end of the trials, beyond the twenty who were executed and the five who perished in prison, 207 individuals had been accused, 74 had been "afflicted," 32 had officially accused their fellow neighbors, and 255 ordinary people had been inexorably drawn into that ruinous and murderous vortex, and this doesn't include the religious, judicial, and governmental leaders. All this adds up to what the Rev. Cotton Mather called "a desolation of names." Marilynne K. Roach earned a BFA from Massachusetts College of Art and works as both a historian and illustrator. She has drawn illustrations and written how-to and travel articles for the Boston Globe, has lectured to groups ranging from kindergarten to senior citizens, and has written several scholarly articles on various aspects of the witch scare. She is a lifelong resident of Watertown, Massachusetts.